There were once wooden blocks set into the cobbles to muffle the sound of carriages. Nevsky Prospekt, they reckoned, was the quietest high street in Europe. Not now. Ducatis howl, Porsches snarl, and a pair of rally cars crackle and pop as they tailchase towards the Neva. Smoky old Ladas keep up as well as they can. The crowds spill out of the five Metro stations along its length and stroll across the series of bridges which span the canals while skaters and bladers weave between them and leafleters step out, proffering flyers for bars and restaurants and ‘gentlemen’s clubs’. There are hot dog carts and ice cream carts every few hundred yards along the pavement. Tour reps stand ready with maps and tickets and credit card readers, and sightseeing boats chug along the canals which bisect the street; the commentary echoes under bridges. It is a four-and-a-half kilometre slice out of Russian history. Mussorgsky lived at No 13. He met at Balakirev’s apartment at No 84 with Tchaikovsky, Borodin and Rimsky-Korsakov. Shostakovich gave his first public performance at No 52; Anton Rubinstein gave his at No 30. Tolstoy lived at 147. Pushkin dropped into the cafe at No 18 on his way to the last duel of his life. Dostoevsky edited The Citizen magazine at No 77. Nadya Krupskaya lived at 97; her fiancé, the barrister’s assistant, Vladimir Ulyanov lived at 83. He got involved in radical politics in his spare time and, like Dostoevsky, was arrested for it and sent to Siberia. He returned, under the assumed name of Lenin. 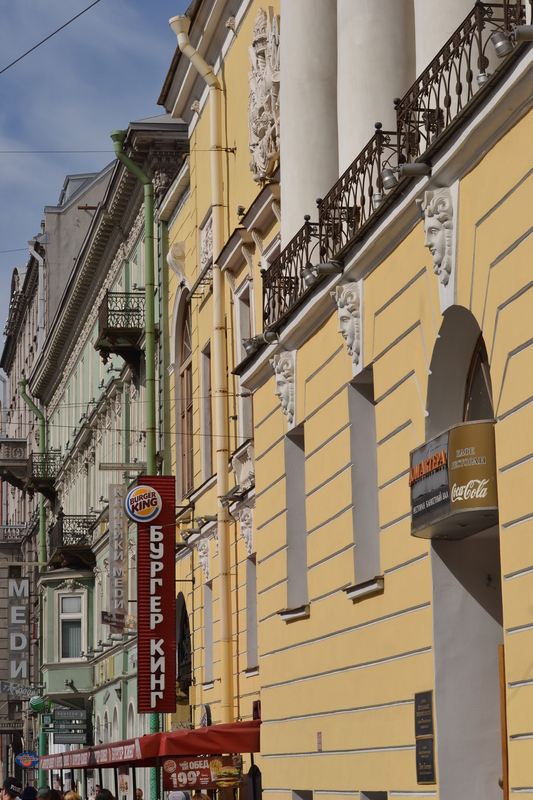 The facades of Nevsky Prospekt are still, by and large, what they were when Lenin returned in triumph to Finlyandsky Station. Some date from the time of Catherine the Great, most from before Nicholas II. The morning air is no longer “filled with the smell of hot, freshly baked bread” as it was in Gogol’s time. Chronic shortages at the bread shops on Nevsky Prospekt sparked the riots which set off the revolution which swept away the Tsar. The bread shops would disappear, as well; and the silversmiths, the perfumiers, the French confectioners and English merchants and the civil servants who parade through the pages of Dostoevsky and Gogol. But, when communism fell, the banks, the insurers, the luxury shops and the five-star hotels came back to this Russian Champs-Élysées. Макдоналдс, Бургер Кинг and Старбакc кофе came with them: two burger joints and a coffee shop, whose world-famous logos help decipher the Cyrillic script. Sberbank remains; so does Intourist, once the state travel agency, staffed by KGB agents, now in joint venture with Thomas Cook. 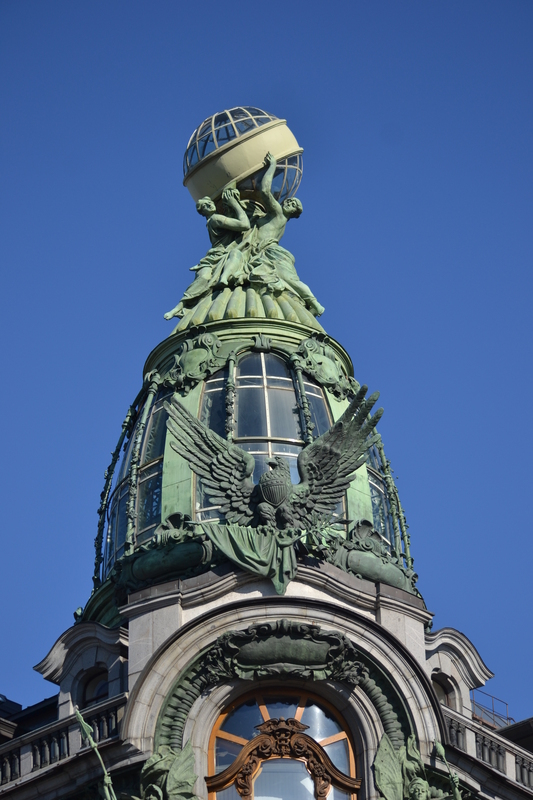 The Art Nouveau landmark, Dom Knigi, offices of the Singer Company in Tsarist times, is still the city’s largest bookstore, as it has been since Lenin’s first years of power. Tourists flock in and go upstairs to sit in Café Singer. They cross the road to see Kazan Cathedral, modelled on St Peter’s Basilica; and stroll round the corner, along the canal, to the onion-domed exuberance of the Church on the Spilled Blood – built on the spot where a Tsar was shot dead. Back on Nevsky, they walk a block to the west to the pink-painted excess of the Stroganoff Palace, where beef stroganoff was supposedly invented, and on, then, to the top of the street with the gleaming spire of the Admiralty building directly ahead and, to the right, the most opulent of St Petersburg’s opulent buildings, the Tsar’s Winter Palace. They might cross the Neva to Vasilyevsky Island or head north to Mars Field and the Summer Gardens or south to St Isaac’s Cathedral, but they will, without doubt, end up back on Nevsky Prospekt.